A stylish spot specialising in Canton-style steamed buns and small plates. Let’s start at the end. Because the best bun at Bun House is one of two dessert buns, which comes filled with dark chocolate and pig blood. Now before you go all eeeww! on me, you don’t actually taste the blood. It’s really there as a form of natural thickening agent, although it does add an umami-like depth, too. It’s sort of like having a warm cup of coagulated cocoa. In a bun. With a ‘just-up-to-the-middle-please’ coat of crunchy, golden coconut flakes. Which, of course, have been deep-fried. It’s the stuff of pudding pilgrimages. Even allowing for the too-faint hit of promised chilli (I mentioned this; they pledged, sweetly and sincerely, to fix it). But what is this Bun House? Well, it’s not a restaurant. Not really. It’s an incongruously beautiful room with a busy takeaway counter and a sprinkling of first-come-first-served tables. There are a few alfresco numbers, too, for top dollar people-watching: this being the junction of Old Compton Street and Greek Street. Downstairs, a ‘speakeasy-style’ tea room is a-brewing. To the buns. Not more bao, I hear you groan. No, not more bao. These buns are the Cantonese kind. Being steamed to order, they have the same pillowy, yielding texture as their Taiwanese cousins, but crucially come served ‘closed’. The downside of this is that the fillings are limited by what you can sensibly put inside, with textures coming in as ‘smooth’, ‘paste’ or ‘small chunks’. 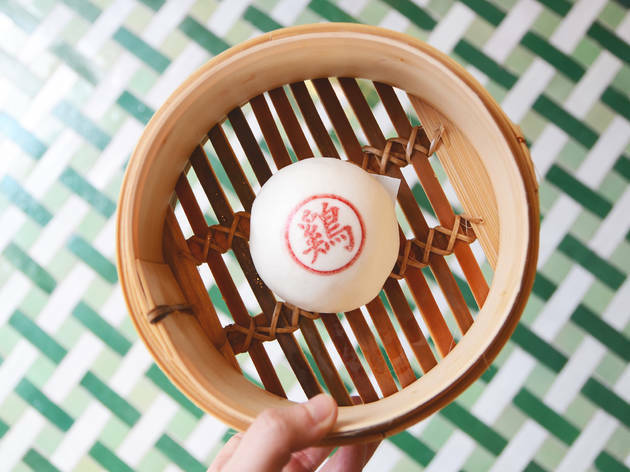 The upside of course is that each bun’s contents are a complete surprise – you match the hand-stamped Chinese characters with the board on the wall. It’s fun. One came with syrupy chunks of pork and a gentle heat; another, billed as ‘cod and prawn’, had a nicely spiced filling – reminiscent of those fish pastes you put in retro sandwiches – and tiny, deliciously chewy shrimp. My favourite, though, was the northern Chinese-style lamb, which tasted – in a good way – like they’d put a chilli and cumin spiced skewer from Silk Road in a blender, then popped it into a bun. But don’t get too blinkered by the buns. Two more star dishes are the ‘fries’ (which are actually deep-fried duck tongues, complete with crunchy cartilage) and the peanut-studded glass noodle salad, with its gentle Sichuan notes, if that isn’t too horrible an oxymoron. 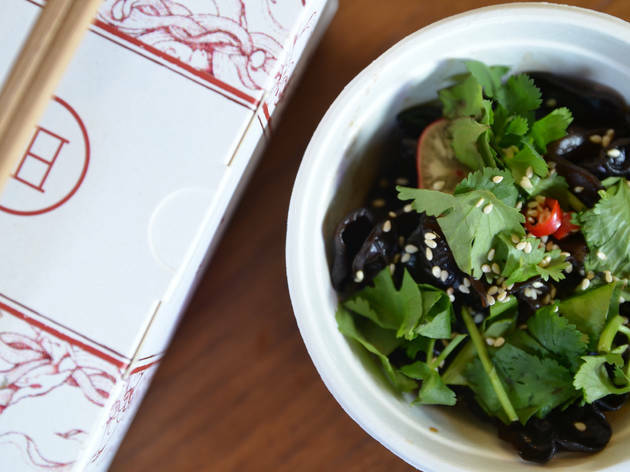 Oh, and don’t forget a portion of the tangy, crunchy daikon pickles – made with black and red vinegar, plus a dash of fish sauce – while you’re at it. Final note: that other dessert. A disturbingly starchy, oozy, salted duck egg custard bun. Start at the end, end at the end. We speak Chinese. We serve Chinese. Hot buns- fast or slow. Green Tea, Hong Kong Beer, Soya milk! Imported drinks, imported music. Westerners welcome! 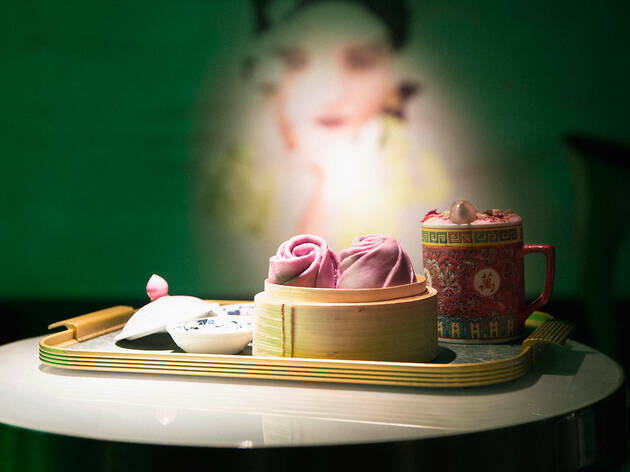 A throwback to 1960's Hong Kong serving up gourmet takeaway Cantonese bao, with pickled treats, dai pai dong favourites, a-go-go records, fried duck tongues, glass noodles and ceramic seats, famous squirty runny custard bun with 100% squirty guarantee. Also pigs blood in chocolate! All day every day, come soon! Meal for two with soft drinks (no service): around £30. 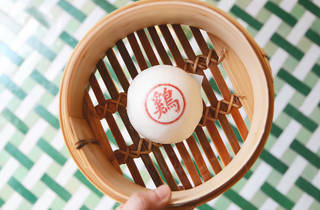 The star of the menu is the Custard with Salted Duck Egg Bun - oozing with creamy, rich yellow goodness. The umami was transportative. But at £2.50, you can get better buns from a patisserie in Chinatown. The other buns are good but nothing to shout about. We tried the lamb, chicken, pork, fish and seafood and veggie buns. The lamb and fish stood out - you can taste the thai basil in the fish bun. Do not expect a char siew bun when you order the pork variety - go elsewhere. The chicken one lack the umami they promise that shoudl come from the miso. We had the glass noodle salad - which lacks zest and the balance of flavour and frankly, rather bland. The lotush crisps was great. We ordered two portions of Duch Tongue fries - which was the other thing that's great in the menu selection. THE SERVICE WAS RUDE, AWFUL, SULKY AND JUST PLAIN UNACCEPTABLE. We were the first customers that walked in that day and they told us they didn't have anything. They listed coffee and tea on the menu but then said they don't have it. Unlike other better restaurants, they don't offer tap water. Strangely when we were leaving, we saw another table having a pot of tea. Because the customer and the waitress shouted at us The Owner said it was okay to make tea for the other table which I found rather rude and discriminative. But it's pointless to argue with rude service who do not take time to engage. We might as well walk away and go to a different place and have a better time. Don't come here. Save your money and your soul. The level of competence and value for money for their food is just gruesome. I discovered Bun House through a quick 'Cheap Eats' Google search despite having walked this street in Soho a thousand times before; it's unassuming to say the least. 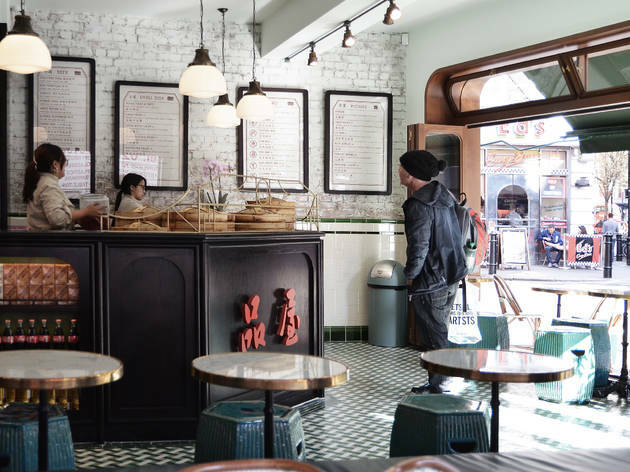 What the site lacks in size it more than makes up for in style, the Hong Kong Tea Room influence has been carefully applied from the Cantonese-stamped Steamed Buns stacked high in baskets right through to the tiled flooring and mahogany counter that you'll no doubt shout your order over. Much like me, you're likely to have been drawn here by the desire to satisfy that deep, savoury craving that only a £2.50 Pork Bun can. 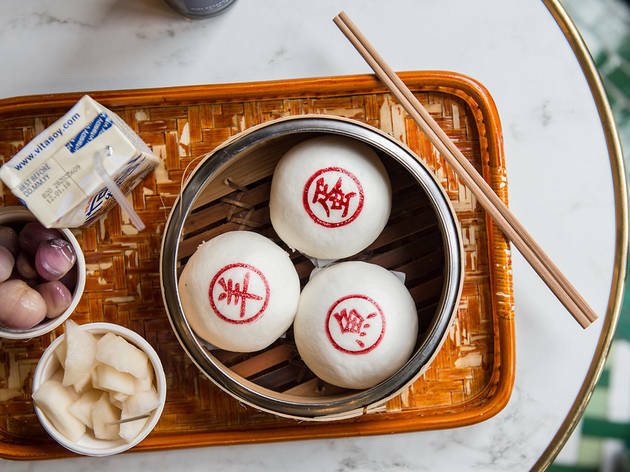 The fact that Bun House is painfully instagrammable will either make it your all-new, ultimate rent week pit stop OR have you marching swiftly across Shaftesbury Avenue to nearby Chinatown, where the Pork Buns taste much the same, are marginally larger and arguably more authentic simply by virtue of being less chic. Sides served in paper cups range in both quality and price; the rolled wok-fried Cheung Fun was chewy, umami joy but not a staple on the menu whereas the Glass Noodle Salad that is was underwhelming. I do have to hand it to them for their imported bottled beer selection, the Cha Chaan Teng is well worth a try. We had a really bad experience at this place. When our bill arrived there was a a service charge of £6.50 on it, which we paid without grumble, but the waitress told us that the bill was wrong and that the service charge was actually meant to be just over £12.00. This was quite bizarre because we paid exactly what the bill said, but she was insistent that the bill was incorrect, and wouldn't let us leave until we handed over an additional £6.00, which we did despite realising this was some sort of bizarre extortion racket. We had the bill and pointed out to her that it showed £6.50 but she insisted it was a mistake and demanded more money. It's a first for me to be told that the restaurant's own bill is wrong and that the service charge, which should be optional anyway, was understated. To be forced to hand over an additional service charge before we could leave the restaurant made us feel like we had been conned. Service was very slow, with nobody coming to take our order for about fifteen minutes, despite the relative paucity of other customers. Cocktails were fine but absolutely not worth the hassle and expense of being held to ransom for a double service charge. Authentic place with a nice selection of fluffy, delicious buns! In the heart of Soho area, this small cosy place is mostly for pick ups as the sitted area is limited. If you manage to grab a seat, its great spot for watching peaple pass by. This is one of my favourite fast food spots in Soho. The buns are delicious and so cheap (only £2.50 per bun!!) with some delicious flavours. The fish bun is my fave. Always really nice staff and the food comes out so quickly! Not much choice on drinks and you can't order tap water but since it's such a quick eat it doesn't matter too much. It's always a fun experience and great to take people who live out of town for a guaranteed yummy experience (which isn't always the case when trying new places in Chinatown, it can be hit or miss!!). Not really a sit down restaurant sort of vibe but great for a quick bite. Highly recommended! What a wonderful little place! Don’t go here expecting table service, and fine dining. It’s order at the counter, a small menu and there’s less than 10 tables to sit at. Buns are super light and fluffy (you can tell their made each day and definitely not frozen). Some interesting flavours like the Veg and also Lamb which aren’t exactly traditional but worth a try. But oh man, the dessert buns win! Custard is easily the best custard bun I’ve had (and I’ve had many) and the red choc is also very good! Really pleased we found this place by absolute fluke -- our destination was fully booked with wait list of 2 hours, we just wanted a quick bite and saw buns -- and so happy we did. We don't judge a place by how it looks, and to be honest anyone calling this 'hipster' obviously have not seen any HK films.... Now onto the food. We were expecting usual Chinatown ready made frozen buns with usual charsiu five spice flavour, and completely wowed by the porkiness and cured flavour of their pork bun. After one we decided to try the fish - also very familiar flavour yet new! The top flavour for us is the choc/pork blood custard umami bun -- amazing as it reminded me of home and how my dad used to cook his really popular dish. I guess everyone's tastes are different -- please do try if you have been to HK and Asian countries, you will completely understand what this place is trying to achieve. Cannot wait to bring friends and family here. 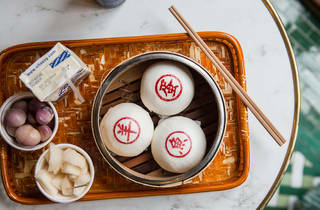 I have to say, if you’re in need for a snack or a quick bite on the run, steamed bao or buns are perfect. They fill you up, are relatively healthy and satisfies that stomach with umami flavours without leaving you feeling bloated and heavy. The bao here is pretty darn legit. It’s super soft and fluffy, and they come out piping hot. The fish had an interesting flavour and the vegetarian bun had a good ratio of mushroom and water chestnut and was full of flavour. Personally, I thought this was better than the fish and would opt for the veggie bun again and try another meat option for next time. The chilli tripe was nice and spicy and had great elastic texture and crunch, and the jicama pickles were crispy and helped greatly with the heat from the tripe. The lotus root crips were indeed crispy; however generally lacked flavour. The custard bun was indeed very “squirty”, so much so I felt that we lost most of it on the wrapping and personally I would have preferred it to be a little less runny. The red choc bun however had a thicker consistency and had a crispy base which was a nice contrast - both were good dessert options without being overly sweet; however I do feel like the flavours were a little muted. Overall, I really enjoyed the buns and would definitely go back to try the rest of the menu (such as the deep-fried duck tongues! ); however there isn’t much seating so it’s not really a place to eat and have a long chat with a friend. They do have the tearoom downstairs, however it has a different dim sum menu (save for the sweet buns from the menu upstairs), and it does take bookings, while upstairs is walk in only. The interior is well done and reminiscent of the Cantonese street stalls that I remember as a child (that green tiling!) without it being too kitsch or naff (read: like an opium drug den). Tip: get in early so you can grab a seat and enjoy your buns. Generally 2 savoury buns and 1 sweet bun, plus a side will fill you up nicely. Good For: quick meal, cheap and cheerful, something light, something different, take away. Whilst these buns are very photogenic and a cool idea, they don't quite set the world on fire. We had a range of ones to try: the pig's blood chocolate pudding bun was excellent! But the others were all just fine. Nice staff and a super location. One for the instagram life. Unfortunately real life isn't as amazing. While the buns were fresh and tasty, your are paying for the hipster decor when equally good buns can be found in Chinatown not 5mins away at less than half the price. Admittedly the custard buns were good, but not enough to entice us for a return visit. Do not believe the Instagram hype - looks better than it tastes and far too expensive for what is essentially yumcha with a limited menu! Don't bother with the side dishes, costs even more than the buns! The buns were good, not great. My friend and I made a trip to Bun House for dinner. I was a bit confused when I arrived as expected a restaurant but this is more of a fast food place than a sit down three course meal. When we went at around 8pm, there were only a few tables to sit at, but all the windows were open which was nice as you can enjoy the vibrant location. The buns were great and definitely worth the price, however I was still left hungry after eating three plus an order of tomatoes. I don't eat meat so only tried the vegetable and fish buns but both were really good and flavoursome. A great place for a pit stop, but don't expect to spend long here (and order more like 4/5 buns). I had high expectations for Bun House, but once I tried it I was highly disappointed. The place in terms of aesthetics really reminded me of "In the Mood for Love" by Wong Kar-wai, but, to be honest, interior design was the only positive note I found in Bun House. Indeed, I opted for a Vegetable Bun which I was expecting to be tasty, or at least, have a strong flavor; whereas what I received was a super small and very expensive bun which was even tasteless. I would justify £ 2.50 for a small bun that has a strong flavor, or in which you can at least understand what's in it, while instead, with the Vegetable Bun I just guessed what was inside,but really, apart from the mushrooms, I had no clue what was I eating. My Chinese friend also told me that from his point of view the buns didn't absolutely taste as the ones he use to have in China. What is more is that when we arrived and ordered our buns, I was told (5 seconds later) that mine was ready, which is not possible if they are prepared à la carte - perhaps it belonged to another customer -. Also, when my friend was given his bun container, the bun fell on the floor as the container was open, they made another one for him, but this second bun was served no longer in that specific traditional bun container, but on a napkin (seriously?) and the napkin, since the bun was warm, completely sticked to the bun, resulting in the need to peel all the paper that had sticked to the bun to actually eat it. We had an annoying and not-so-postive experience, I won't be coming back! I was thrilled when they first opened, my favorite is the custard bun. Though they are a little pricier than places in Chinatown but not bad for Soho. It's definitely one of those things that's perfect for snacks. I would just go for the custard bun next too. I heard about Bun House opening a few weeks back and was really excited to try it because I absolutely love Chinese steamed buns! The menu has a range of baos along with different pickles and a set of various sides. Pig Bun – This is a traditional flavour for a bao, filled with barbecued pork that has a sweet and savoury marinade. I was looking forward to this one because a Char Siew Bao is my favourite type of savoury bao but this version was quite different. The marinade didn’t taste like regular char siew, as it didn’t have that sweet flavour to it. It was pretty average in taste and didn’t end up being my favourite, as I thought it would! Lamb Bun – In my opinion, this was an interesting choice of meat to put into a bao. It’s not one that you would normally find in dim sum but it was pretty good! It was pretty flavourful and cooked well. I could really taste the spices used to marinade th meat. Chicken Bun – I normally like a chicken bao too but this version was quite unique! It had liver pâté in it and a hint of miso flavour, but because the former has a strong taste, it overpowered the miso. I enjoyed this a lot more than I thought I would and would gladly order it again! Fish Bun – Upon seeing the filling of this bao, it made me think of the Otak Otak, which is a Malaysian/Indonesian grilled fishcake. The fish meat and prawn meat were mixed together to form a sort of paste and marinated with some delicious flavours. However, it wasn’t actually spicy, as it is marked on the menu. Veg Bun – This was another flavour I wanted to try and was really happy I did! It was truly filled with mushrooms and vegetables and I could see the chunks, which I really liked. I couldn’t taste much of the water chestnuts though, which is a shame because this would have added a nice crunchy texture to contrast against the fluffy bun. Custard Bun – Hands down, my absolute favourite of all the buns we tried! This flavour is also a typical one you would find at a dim sum restaurant and true classic. I love the blend of sweet and savoury in every single bite and how the custard actually oozes out as you bite into it. They are best consumed hot and fresh, so I’d recommend eating them once they are served to you! It was also really nice how they came out fresh and steaming but weren’t too hot that we had to wait to eat them because trust me, you won’t want to wait! House Fries & Mayo – Another top favourite among the dishes we ordered, this was genuinely so unique and delicious! I’ve never had duck tongue before, even though I’m told this is a typical Chinese dish served in restaurants. These were coasted a batter, deep-fried and drizzled with a spicy mayo on top. It was so tasty that we ordered this twice! Chilli Tripe – Another new dish for my palette, this was cow tripe in a black bean and chilli marinade served with fresh coriander leaves. I liked that there were actual pieces of red chillies in this and a good amount of coriander leaves. It was also genuinely spicy, enough to put me in a coughing fit because of how spicy the oil was! The tripe had a chewy and rubbery texture, which I know is not to everyone’s liking but I really liked it. Lotus Root Crisp – This was a simple yet satisfying dish of thinly sliced lotus root deep-fried like crisps and seasoned well. It was enjoyable to have as a starter before our buns arrived and came in a good amount to share among three. Glass Noodle Salad – This was another dish that I really wanted to try because the pictures looked intriguing when I saw them on their Instagram page and location tag. It’s a cold noodle salad with a black vinegar and peanut dressing served with fresh coriander leaves. It was delicious and I really enjoyed it too but the noodles were definitely not ‘glass noodles’, at least not the glass noodles I’m used to. These were thick and resembled Kway Teow noodles but had a nicer chew and bite. Overall, the food was amazing and I was quite surprised by how authentic some of the dishes were. The sides came in reasonable serving sizes and were all seasoned and flavoured well. However, I do think that £2.50 for a single steamed bun is a little steep considering that most other Chinese restaurants in the Leicester Square area would give you 2-3 steamed buns for that price. The steamed buns had interesting flavours and it was a nice twist on typical Chinese flavours mixed with some Western aspects but I don't think they're worth £2.50 each! They were also quite small in size, but to be honest, the only one that would be worth paying that price for a single bun is the Custard Bun. Those were executed really well! The service however was poor. The first woman serving us at the till was quite cold, and we were the first customers of the day. I would understand if it was later in the day and she had already worked the day away because working in service in the food and beverage industry is tough, I know this from personal experience. This was obviously not the case, as we arrived early. When it came to ordering drinks, we wanted some tea because dim sum goes really well with black tea to cut the greasiness out. Even though tea is listed on the menu, she said they weren’t serving any “yet”, which I didn’t understand – why have it on your menu, if you aren’t serving it? At least put a ‘not available’ sign if this is the case. Then when we wanted to split the bill, she made an irritated face as if this was such a hassle to do. Firstly, it isn’t. Secondly, the electronic system does it for you to split the bill and it isn’t hard to divide the total by three. Lastly, when it came to serving us the food, she was so lazy she didn’t even bring it to our table! In our second round of orders, she simply placed it on the counter at the till and signalled for us to come get it. Even though we were seated near the till, I thought this was quite rude of her, given everything else before that had been served to us. As we were leaving the restaurant, we noticed two other tables with tea pots and we confused because we were told that they weren’t serving tea when we tried to order some. The ladies told us that apparently the owner had ‘allowed’ it when they ordered it. I cannot comprehend how that decision was made within the span of half an hour between us ordering and this table of ladies ordering. Frankly quite shocking and unacceptable in terms of the quality control of the service at this eatery. I gave it three stars based purely on the creativity of the flavours in the steamed buns and the excellent sides. Hell to the no. Buns not worth the price - sorry. Great concept and amazing food. The buns are filled with a variety of exciting flavours, complimented by a great selection of sides and pickles. The lamb bun, duck tongue fries and prickly cucumber were all winners for me. The design is awesome too, a really cool space. Could not recommend this place enough! If your looking for something quick and tasty this is the place to go. Also a really lovely place to chill in the centre of Soho. The interior is great and feels very top quality. The Bun's are really delicious and value for money with a great range of fillings. I personally recommend the custard buns if you have a sweet tooth, so delicious! You would need about 3 to fill you up therefore £7.50 is a good deal for a meals worth. Just like a Hong Kong cafe, this place is an absolute gem on Greek Street. I met some friends here for lunch on Monday, so we got to share and try most of the dishes. The best thing was the custard bun and the deep Friend duck tongue! It was so good, we ordered another one! The buns are quite pricey at £2.50 a bun and may feel you still feeling peckish! Unfortunately, service was terrible. Our waitress was very rude and all The drinks on the menu, she said weren't available, and also no tap water! Which I find hard to believe! For a tea house, not to have tea, I just don't understand! It's a nice place, but service and price is a little to be desired Top Tip- custard bun and you won't go wrong! I absolutely love this place! I'm originally from Hong Kong, that's why I felt right at home. The steamy bamboo baskets, smell of steaming buns and I especially love the open set up with the big windows wide open overlooking the buzzling soho - good spot for people watching! Last of all, nothing beats their custard buns and did I mention it's made from salted egg? I'm definitely go back for more of that! I'm in two minds about this place. Firstly, I love the look, design and concept of the place. It's not easy to get street food in London, and this is a great place to pop into for a quick bite if you're on the move and a bit peckish. On the other hand, I'm not sold on the execution of the restaurant. Buns are £2.50 for arguably small portions, with mostly a dense bread that some will say is too expensive. The fillings are varied yes, but aren't exactly amazing in flavour. The best are the custard bun and the vegetarian, with the pork bun being a far inferior version to the char siu buns you can get 3 of for £2.50 at many dim sum places, or even frozen to cook yourself at home. Throw in decent but not fantastic sides including pickles, fried duck tongue, and the overall food experience is a bit average. It's only just opened though, and I will be a regular even for just a quick bite or the custard buns, but think there's still work to be done! What a disappointment this place was. I arrived around 6pm to find that it was more of a fast food kinda place with only a few tables (you can book for the tea room in the basement but it has a different menu). It pretty much filled up within 10 minutes of me arriving so it resulted in people hovering around for a table and watching you like hawks whilst you ate. There's also no table service so you basically place your order and are given a number so you collect your food when number is read out. We tried all the buns excluding the chocolate and pigs blood one. They were all lacking in flavour and were just overall very underwhelming. We also ordered 2 sides which were the duck tongues and the noodle salad. The duck tongues were left untouched after our initial taste - they literally tasted like greasy batter and the noodle salad was just ok. The tea room downstairs had interesting decor but I don't think I'll be returning there any time soon. This is a wonderful place in Central London, perfect when you want to grab something cheap, quick and super tasty. 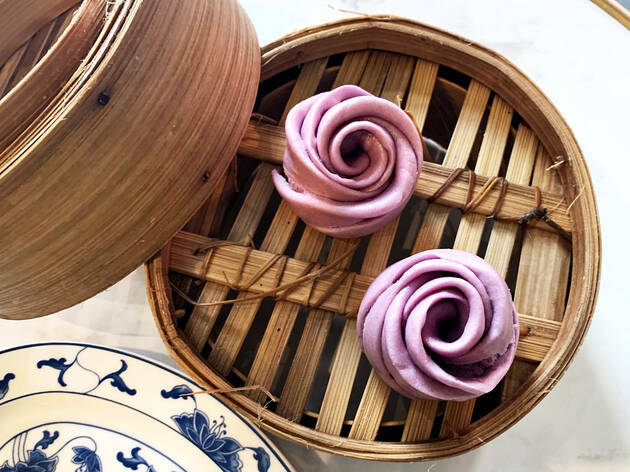 I love their selection and I'd recommend you to try the classic pig bun and most importantly the custard bun, which tastes as good as it sounds! They also have many kinds of pickles if you like them, I'm not a fan so I just had three buns and they were sooo good! I love a good bun, and these definitely put a bit of a twist on the usual bao you'd find elsewhere. I got 3 bao, one pickle and a side and was fuller than I imagined. The standout one for me was the fish one, something I'd never tried before but was glad I did! Couldn't recommend this place enough!! Such a lovely place to relax and eat delicious food in the centre of Soho. The interior is to a high standard and the buns are really delicious. Staff are incredibly friendly and helpful. You need about 3 buns to fill you up, which at £7.50 for a meal is good value for money. I personally recommend the custard bun's if you have a sweet tooth, so tasty!